This week we will celebrate the 8th birthday of The Boy Wonder. This comes as no real surprise to me. On the whole I’ve remained conscious throughout that time and have watched my first born grow into a pretty cool little boy. He’s been ‘bounce off the walls’ excited since New Year and this last week has been almost unbearable…up and dressed by 6am, running around the house from 6.05, I had better go to bed by 8pm on Wednesday as the chances are he’ll be up at 2am to celebrate his big day. I’ve had his present list since January and it’s all very reasonable stuff so I thought we were sorted. Eight isn’t a mahoosive milestone and he’s got to that lovely age where he’s happy to take a couple of friends to the cinema and come home for a birthday tea so all within budget. But, we’ve had a bit of a hiccup. Our trip to Wales has thrown in the proverbial spanner. When we met with our friends in Wales it turned out that their nearly 8 yo already owned this most prized possession. My first response was concern with a hint of panic. The what-if brigade did a fly-by, coating me in a confetti of health and safety issues. 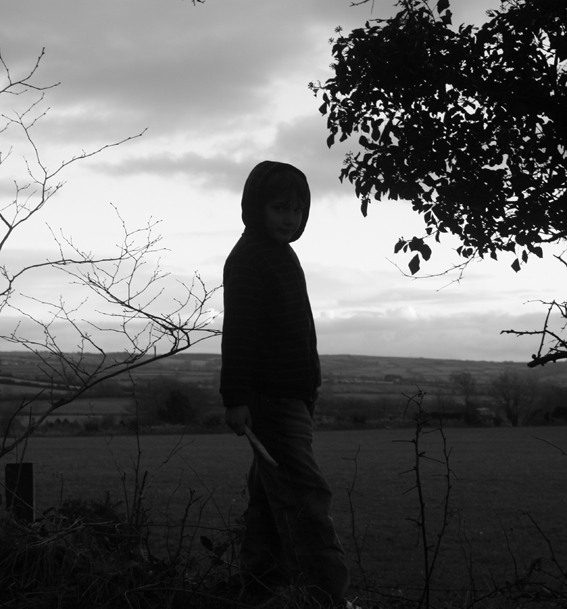 But I quelled them all, I listened and I watched as my son was shown how to use the knife, how his serious little face demonstrated its understanding of what it all meant and how his poppety head nodded earnestly, agreeing to ‘the rules of use’. Do you know what? It was all fine, the boys cut branches, they made spears, they whittled…he made me a boat! But what really impressed me is that there was not one occasion where the knife was treated with anything other than reverence. It was clearly being used as a tool, never a weapon, and my imaginings of laughing antics involving knives being waved in faces, emergency trips to A&E and my own ‘I told you so’ tone echoing around the cottage simply didn’t materialise. Even more significantly, despite a global ban on his DS (even when his friend was playing his own digital game), my son still managed to amuse himself with only the odd tantrum about what was fair and it had a lot to do with access to the great outdoors and a penknife. I’m well aware of our society’s tendency towards emasculation, I’m guilty of it myself. At my son’s last school he was singled out by a particular teacher who obviously enjoyed teaching girls and thought that every boy needed to be reigned in and ‘broken’. Thankfully at a new school the same enthusiasm was recognised in a more positive light, embraced and channeled. I’m all for allowing boys to dress up in Snow White costumes, braid their hair and act as girlie as they like (and I have the video to prove it….saving that one for the 18th birthday) but I’m increasingly aware of the need to let boys ‘be boys’ and to not expect an apology for it. But what now? What do I do? My son has clearly demonstrated that he can be trusted with a penknife (for 48 hours), he wants a penknife for his birthday. I have reservations, the OH more so, but what message does it send if we say no? Please do vote and leave me comments with your thoughts…I’m in a bind and I’ve only got 48 hours to make a decision! I’ve all this to come (Max was 2 last Friday) – it’s going to be a tough call. Let me know what you do! I know my nearly 8yo and your nearly 8yo are fairly different characters, but I think I’d just be worried about thumbs being hacked off by accident. And I know, I sound neurotic! Sigh. I can’t help myself. I also voted to sit on the fence. Not terribly helpful. I had a penknife aged about 8 and was always really careful. I think as long as you have good groundrules (including threat of removal for misuse) then it should be fine. We had some friends for tea the other week, their oldest is 4. My almost 8yr old was slicing fruit with a sharp knife for pudding. The other mother gasped ‘Eve’s got a knife’ but I didn’t bat an eyelid because I knew she’d be fine. Our job is to help them grow up and be independent, and they can’t do that if we’re always preventing them from doing stuff ‘just in case’. I guess I should have voted yes. Oopsie clicked on submit before I was finished. If he’s very clear about the rules, which of course include “no taking this to school to show your friends, even if someone else does it”, then I think it’s worth a go. Eeek, it’s still a tough decision. I voted yes. However, I would put conditions on it’s use, for example not allowing him to take it to school, or out and about, allowing play in the garden, or woods with adult supervision. By supervision I don’t mean the adult being stood over him the whole time, but just there in case an accident occurs. Oh dear, I really feel this decision as my eldest will be 8 next month. He hasn’t asked for one and I would be inclined to say no to my fella. Not because I don’t trust him with it, but I suspect I would get a lot of grief from other parents if I allowed it. Mind you I carried a penknife at that age as I loved crab fishing and we used them to get the barnacles out of their shells for bait. I never waved it in anyones face, I honestly never thought of it as a weapon, it was functional. He sounds like a sensible lad (my fella is as excitable as yours, but sensible also) so trust your instinct:) Jen. I voted yes, but now I’m wimping out! I think I wouldn’t give the knife for a birthday present as I would want to place limits on it’s use (not carried around all the time, not to school, adult’s around though not hovering!). But I would get a pen knife – maybe a “family” pen knife that everyone can use with some rules in place. That way could show trust and he can develop his skills but you don’t feel you’re depriving him of his birthday present when you have to place limits. I voted Hmmm. Because I’m not really sure. I don’t have a boy and I don’t think Amy would be too bothered about a penknife. But I’m against knives. Only thing is, don’t they use them in the scouts? I remember my brother always owning one since I can remember and he never came to any harm. It’s how the child is disciplined to use it that matters. And I think yours will be absolutely fine. I voted no (but I don’t think you’re mad, in fact your good to counsel advice). We all know what’s best for our children, but do we know their friends? My 10yo is eminently sensible, but I wouldn’t let him carry a knife because one never knows what situations it might end up in. The responsibility is not slight. Allowing him to use one supervised is a good idea. An interesting item on a very appropriate day as it is Thinking Day – Lady Baden-Powell’s birhtday. I’ve voted Hmmm because I think it does depend on the child & in the wrong hands it could be a problem. However, your lad seems to have approached it in a very mature way. One additional comment I would add to those already posted is that it may well be a phase that goes as quickly as it comes! Very familiar with this scenario. We’ve had a couple of penknives in our house. I usually buy them and then when they’ve lost interest/are not looking snaffle them away. Personally I think it’s just a boy thing and if you try to suppress their natural instincts at this age you may be storing up a whole heap of trouble. And if you think back to the 40s/50s, boys would have had penknives, no questions aasked. My husband is very into bushcraft and makes bushcraft knives as a hobby, he is also a scout leader. He thought that you might find this article useful http://tinyurl.com/y9bqeea it’s an article about The best whittling knife for a child. I said no, purely because my son is a clumsy oaf and would be fingerless in days. But if he’s supervised and understands that he’s only to use it for X, Y, Z and you trust him to abide by those rules, then sure. If the owner of the penknife (of any age) is taught to respect the knife then there should be no issues. At 8, I’d expect him not to be taking the penknife anywhere on his own (without supervision) so there wouldn’t be any chance to misuse it. Thanks to all of you for your excellent comments. You’ve given me so much to think about. Now only 24 hours to go and I’m still ‘hmmm’ but veering towards a yes with strict rules. Interestingly those of you who had owned penknives yourselves as children were more likely to say yes than those who hadn’t. The article that Helen recommended was very useful: http://tinyurl.com/y9bqeea I think it’s a good attitude to have. I for one have always been part of the “Don’t touch that, it’s a knife!! !” brigade and I think that I will aim to be more encouraging of the proper use of household knives now. Whatever my decision this year, I think I will say yes at some point. A knife becomes a weapon in the wrong hands, it is not (generally) designed for that use. First and foremost it’s a tool and a more positive, prevailing attitude is the first step to discouraging inappropriate use. My H brought back some knives for the boys after a trip to the Arctic ….yes they were probably sharper than a pen knife but son no two couldn’t resist a peek even though the knives had been hidden as I was worried about them. He nearly cut his finger in half…he has a lovely huge talking piece of a scar across his finger and the next one and is terrified of knives now. Do you live in the country or a city and what would he use it for? Poor boy- that must have been horrible! That’s the danger isn’t it? It’s one of the reasons that I enjoyed the article I read, it talked about teaching children how to use knives from a very early age… just normal, household knives but taking away the fear and the intrigue through normalising their use. I think there’s a lot to be said for it but I’m still concerned about the what-ifs! Country girl at the moment btw, with a big, unruly garden and lots of opportunity for cutting branches and whittling within a pretty much supervised area. My 5 yo wants a penknife too – I’ve told him he has to wait until he’s 8. So there you go. I highly recommend The Dangerous Book for Boys. Really, I had a penknife at that age (tho I’m a girl and we’re remarkably more sensible) and never injured myself or anyone else – though I did manage to cut my thumb open witha butter knife! He’s already shown he can be trusted with one. You need to let him learn. That’s how I feel. We have that book and I love it…proper ‘boys own’ stuff. I agree with you on the rules and yes, confiscation will always be the number one punishment! I’m going viewing tomorrow morning, so we’ll see!